iWindsurf Community :: View topic - RS-X Uphaul use while sailing? RS-X Uphaul use while sailing? Posted: Tue Aug 09, 2016 6:43 am Post subject: RS-X Uphaul use while sailing? 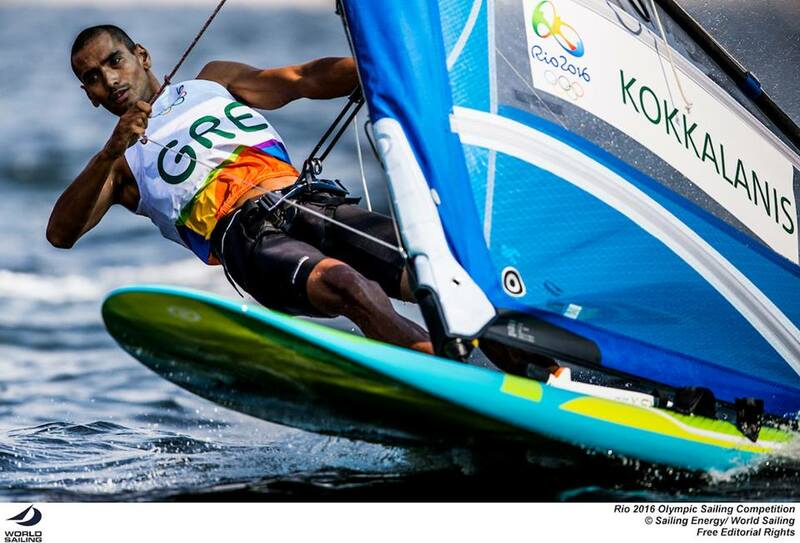 RS:X sailors at the RIO Olympics are holding on to what appears to be an uphaul with their front hand while sailing/planing. I am not familiar with this equipment and technique and couldn't find any info in the RS:X class rules or on the internet. Can someone please provide some background/theory on this ?? It's an adjustable downhaul, so they can flatten the sail on upwind legs, then let it slack for a fuller sail on the downwind legs. They rig adjustable downhauls, but that's not it. The adjustable downhaul has a cleat, so you don't have to hang on to it. They're hanging on to the uphaul to get their body in a position that makes it a more effective counterweight. One design racing is the pinnacle of getting every last ounce of performance out of your gear. Notice that when they pump, they go back to both hands on the booms. True that it's an adjustable downhaul, but that would not be a reason to hold it pretty much the entire time they sail (unless they are pumping). IIRC, Farah Hall said you get better upwind angles by holding the uphaul. Ok, makes sense, what konajoe said. They also have adjustable outhauls, which I assume they use on fly much like formula, but do they use the adjustable downhauls on the fly? Maybe only when wind strength changes are significant? Sailors’ center of mass is way further out and further back than would be possible holding on to the boom with the front hand. The force directed onto the board is directed more along and forward and less down and to the side. Years ago some of us fooled around with a handle mounted to the boom ahead of the harness lines, which offered similar advantages but with the inherent instability of ‘80s sails was not all that practical. The picture in the post does look like the downhaul but these guys are in fact holding the uphaul a lot of the time. I think it’s mostly a Formula-derived technique but it’ll work whenever apparent wind is fairly constant. If you’re going really fast in comparison with the actual wind you can even jibe like this but that’s sort of a freestyle show-off rather than a practical racing skill. My best guess is that the adjustable outhaul and downhaul are cleverly integrated. One pull on a rope probably increases downhaul and outhaul at a predetermined amount. Downwind, pop the rope to slack outhaul and downhaul at a pre-determined ratio. I believe it's about getting out, not back farther. That can be done without using the uphaul. You'll see the same body positions on the lasers, catamarans, etc. It is a technique for going up wind and planing through lulls. When sailing at Garda this summer I noticed many of the sailors using this technique and I noticed every rig I rented had a special handle on the top part of the up haul. I also noticed all the up hauls were stretched out as a side effect. When I talked Andy Brandt about the technique he told me the Olympic sailors use it to get as far away from the rig as possible. It works and we will now start teaching it as well. It's done on upwind legs when the wind is marginal. By holding the uphaul you allow the sail to be more vertical = more power and getting your weight off the board by hiking further out makes more speed. I'll bet that it's not just marginal winds. In higher winds, which they probably won't get, it should work just as well. Hiking out is hiking out. But I also bet that you won't see it in sub-planing conditions. There it will be a 'both hands on the booms pump fest'.